This story is about Stephen Offer who was involved in the tragic events as a consequence of the pit fire and explosion in 1881. Stephen Offer and his new wife had come from Bristol and the Somerset mining community to the Whitfield Colliery in 1873. By the year 1881 Stephen was a supervisor and although he was not on duty on the night of the disaster, the colliery manager, Mr. Edward Thompson, nevertheless called for his help in the early hours of that fateful morning. I wrote the following as part of our family history, my wife Margaret is a great granddaughter of Stephen Offer. 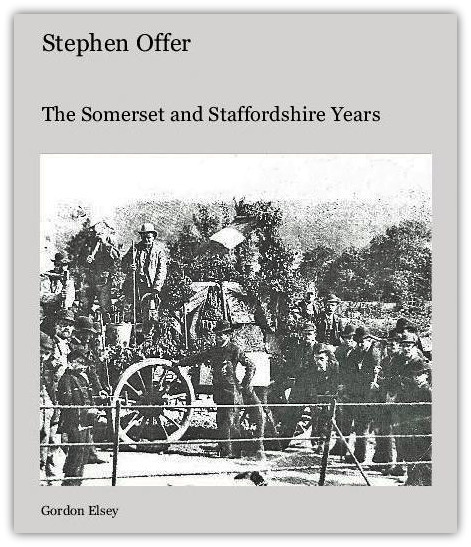 I published a 70 page book in 2012, through the online publisher Blurb, with the title Stephen Offer – The Somerset and Staffordshire Years. At the age of 50 Stephen emigrated to South Africa with all his family except the eldest son (my wife’s grandfather). The book has enabled descendants, spread worldwide, to get to know the remarkable man Stephen Offer. The Explosion at The Whitfield Colliery in 1881 forms one chapter of the book. Nearly all of the following is fact extracted from the 79 pages of the Proceedings of the Inquest with a little conjecture on the part of the author to add colour. The Coroner, John Booth, took the central position at the long table that had been set up by the innkeeper in the upstairs room of the Norton Arms public house. It was not the first time that an inquest had taken place in an inn, but it was the first time that this particular inn had been given such an honour. Wednesday 8th June 1881 was an unusually cold day which was, maybe, just as well because every inch of space was taken in that upstairs room. A juryman sitting near to the window glanced out as another wintry shower beat against the windowpane, blown on a sharp northerly breeze. It was if the weather itself was giving evidence to the enquiry; a sharp reminder of the icy conditions on that infamous Monday morning when the coalmining villages awoke to the rapidly spreading news of the pit disaster. On that day, the snow lay deep on the ground and there was a biting wind. The difference between the panel at the long table and the Jurymen was marked. The jury consisted of 14 men, mostly local people and included some tradesmen associated with coalmining, iron and the potteries. The jury were in their Sunday best. They owned a working jacket and also a best jacket for church and the rare special occasion. Not that any one of the jury wished to be there. Having to take time away from work was costly and this was a painful reminder of that awful day when 24 miners died at Whitfield. Shirts were neatly buttoned at the neck and some wore a neck scarf. John Booth stamped his authority on the inquest by his precise and demanding manner but this was supported by his appearance. He wore a cutaway frock coat over a formal waistcoat and at his neck he wore a large bow tie – of sombre colour as was fitting for the occasion. The tension building up in that packed makeshift courtroom was raising the room temperature well above that of the street outside. 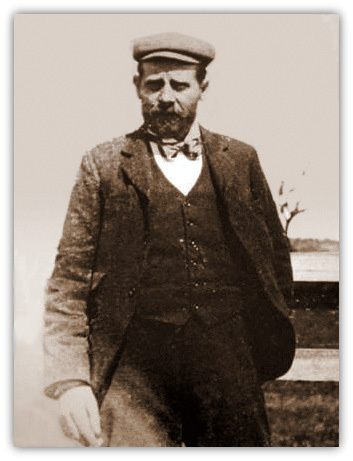 What was at stake was the reputation of Mr Edward Thompson, the Colliery Manager. Stephen Offer sat patiently in the downstairs room of the public house. He was not alone. He was one of a number of witnesses who would be called to the court in the upstairs room that day. His dress was similar to those of the jury. He was of similar status to them, maybe higher. He certainly thought of himself as higher. At the age of 29 he was doing well. After working in the Somerset coalmines since leaving school at 14 he had come with his wife Priscilla to Staffordshire in 1873 and within just a few years he was now underlooker at the Institute Pit of the Whitfield Colliery. An underlooker is known as an overman in modern pit language and in general terms he is foreman in charge of an underground district and reported to the district deputy. As he waited to be called his mind drifted back to the night of 7th February 1881, in the early hours of that Monday morning . . .
An elderly man hurried as best he could through the snow. The wind was bitterly cold and James Offer pulled his cap over his eyes as he faced the icy blast making his way carefully down the Leek Road at Norton Green. At the age of seventy-four he was still lucky to be employed as a furnace-man at Whitfield Colliery and he was making his way home having finished night shift four hours early. Half of the fifty-six on the night shift had come up from Institute or Laura pit heads and the other half had not, or, could not. The trudge through the snow had taken James about forty minutes. He was breathless and exhausted. He burst in the back door calling as he entered ‘Stephen!’ On this occasion it did not seem to matter that he could be waking six year-old grandson James and his baby sister Eliza. It was 2.35am. James wife Charlotte had died a few months before the marriage of Stephen and Priscilla and so James also abandoned the Midsomer Norton, Somerset home and was living with his son and family. Strange that the name Norton applied to both homes but this Staffordshire freeze was harsh compared with any winter in Somerset! Stephen Offer came downstairs soon to be followed by Priscilla. ‘There is a fire in the pit!’ James gasped. ‘You are wanted at once by Mr Thompson’. Stephen quickly dressed and hurried as best he could through the snow towards the colliery. On the road which goes through Ball Green he met several miners who said that the pit ‘had been set on fire from the smith’s shop, and we was to make haste’. Haste was difficult through the snow. Stephen, as underlooker, knew all his team. Many were close friends and he was anxious to render what assistance he could. Anyway, the Colliery Manager Mr. Edward Thompson had sent for him. Close to the pit he met Thomas Mountford and William Ridgeway coming away from the pit. ‘Good Morning’ said Mountford to Offer who was going in the opposite direction. A strange greeting in this very abnormal situation. And to the Offer question ‘Are there men still in the pit?’ Ridgeway replied ‘They were chiefly out’. Did they not realise that, at that moment just coming up to three o’clock, there were more than two dozen miners still down the mine as well as six of the ten pit horses, or did they want to dismiss from their minds the possible disaster? They had left their shift because they were afraid of what might happen. Early in the shift, which started at ten o’clock, the sixteen-year-old William Moreton and some other young miners had lit a coal fire, for warmth it would seem, at the site of the underground smithy. This had got out of hand by eleven o’clock and attempts to contain the fire included sending down buckets to douse the flames with an underground feed-point. The potential for explosion was exacerbated by the position of the smithy in relation to the ventilation arrangements.